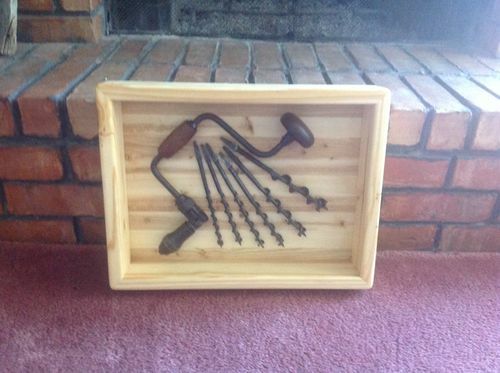 I am building a wall hanging shadow box or maybe just a frame to display a brace & bit set that belonged to my uncle. This will be gifted to my aunt or to one of my female cousins. The display box / frame is all milled lumber, while not exactly what I would call fine woodworking it’s not rustic looking either. My leading candidate to attach the brace and bits to the back panel is some thin steel wire that I would paint black. The back panel is wood. Looking for alternate recommendations that will be unobtrusive. Thin black wire is good. I used thread in s similar application. I think thin wire, black or plain, if attached to the brace in unobtrusive places would be virtually unnoticeable. Not sure how the bits should be hung. Good luck! I would use rebar tie wire. Its already black. Most home centers would have it in concrete/rebar section. You might also consider using the brace & bits to bore some holes into a matching/contrasting piece of wood to hold the bits and brace to the shadow box. Cut the piece down the center to get some semi-circular brackets to mount the brace/bits to. I fabricate up some nice (but semi-rustic) steel straps to brad nail into the brackets to help support the brace/bits. Using the tool in the construction of the display, will add some more character to it for the recipient. Thanks to all for the ideas, they are appreciated. Put in a sheet of felt over the back before attaching the brace & bit. For medal boxes put a sheet of 1/2” Styrofoam under the felt. Blue for navy green for army and red for item show cases. Attach felt with spray adhesive in all cases. Thin cork (1/16”) works too. I went with some steel wire.